However cancer maybe anticipated in fantasy, the reality is different. Somehow the stories we have in place never fit the reality, and sometimes this disjunction can be worse than having no story at all. ~ Arthur W. Frank (2013, p.54-55). And then, I saw the logical flaw in my reasoning. The reality is, if something did happen, I would have no clue how I would react. I would have no idea what would change or not change. Worrying about the what if is just a waste of energy. So, what caused today’s what if? Actually it all started yesterday morning. Stacey (@coffeemommy) and I were up at UCSF to give some of our blood for research. When it came to be my turn, I put both hands on the table and notices that my left hand was visibly swollen. Fortunately, Stacey was quick thinking and suggested I remove my wedding ring before the swelling got any worse. After donating two small vials of my blood (we used the right arm), I made a quick phone call to my surgeons office. I was in to see her assistant later that day. 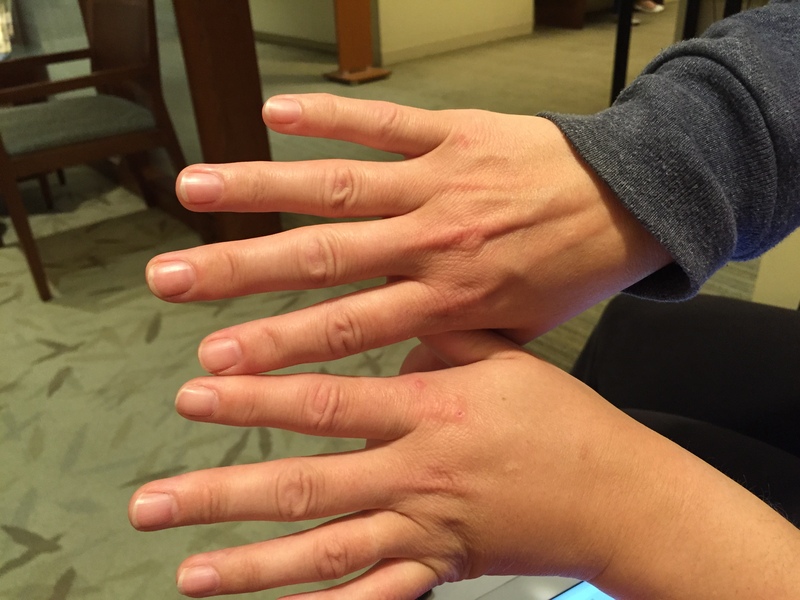 We are not sure what it is yet, but the biggest suspect is early stage lymphedema. This is can happen as a side effect of breast cancer surgery – specially because they remove a few lymph nodes to ensure the cancer hasn’t spread (or if it has, they remove any cancerous lymph nodes). I have only had a couple removed, so I was at very low risk for lymphedema. It won’t get diagnosed for certain until next week. I have an urgent referral for the lymphedema clinic at Stanford, so hopefully I’ll get in to see someone on Monday or Tuesday. Now, the what if, I would … if I need to wear a lymphedema sleeve I’m going to try and get a paisley patterns one so it looks like I have a full arm tattoo! Becky, I’m sorry you may be dealing with another collateral damage. I haven’t experienced this but I may have cording (?). I feel this long thick something going across my arm (resembles a vein? ), starting from my underarm. I have mentioned it to my doctors but they don’t seem concerned yet. It doesn’t bother me as much but there are times when I feel a discomfort, especially when lifting. I hope things get better for you. Good luck! Ya, I had a little cording but nothing too bad. I found that doing a doorframe stretch (hand as high as it reaches leaning into the doorframe) helped to make the cording better. Now, what I has was only very mild. This swelling is a little odd but not too uncomfortable (it was a little sore last night, but less so this morning. So for now I’m just monitoring it and hoping that I’ll have an appointment soon at the specialist clinic. I’m hoping it’s not lymphedema Becky but I’m with you on the paisley arm band. They do make some pretty awesome looking sleeves these days. Be well and keep us posted. Resilience required but not always a requirement we relish!! First, I have to say you have lovely hands. And, I love your attitude/sense of humour shown in the last paragraph. I’m at the beginning of my journey and hope I can approach things in a similar manner.